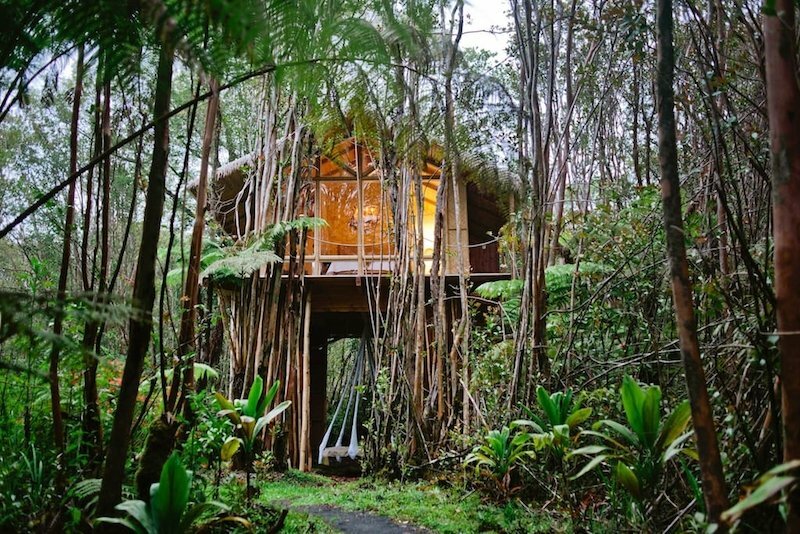 These unique Airbnb homes in Hawaii are more than a place to sleep – they make up part of the holiday experience too. 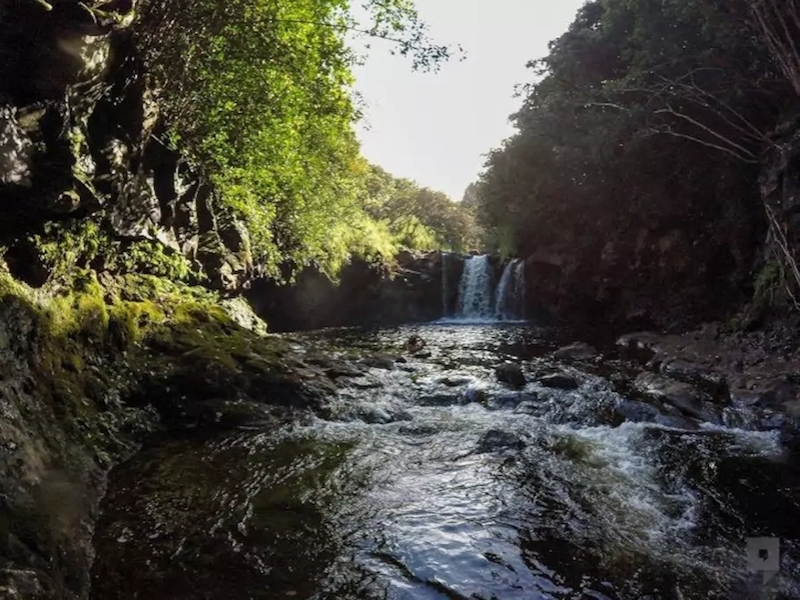 Hawaii is more than a beach destination. Beyond its sandy coasts, it offers lavender fields, coffee farms, zip-lining adventures, hiking trails amid volcanic landscapes, opportunities to see dolphins and humpback whales, a variety of delicious food truck meals… the list goes on. 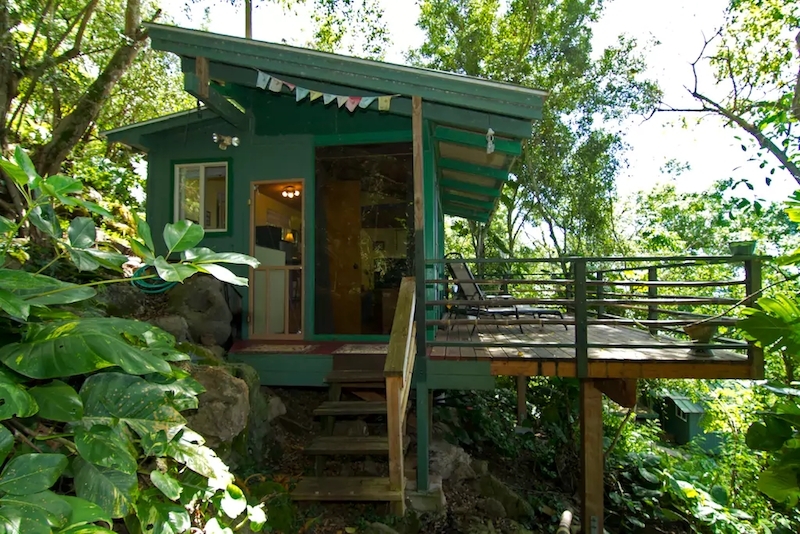 Hawaii’s also just the kind of place to try out unique stays, be it a treehouse in a fern forest, an off-the-grid cabin with a private waterfall, or a studio loft that overlooks downtown Waikiki. 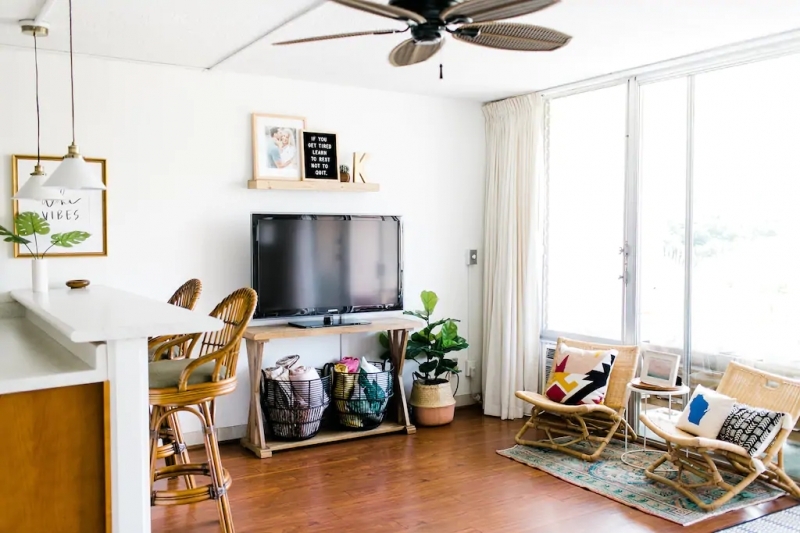 Full of character, these Airbnbs in Hawaii will definitely add to making your vacation an unforgettable one. 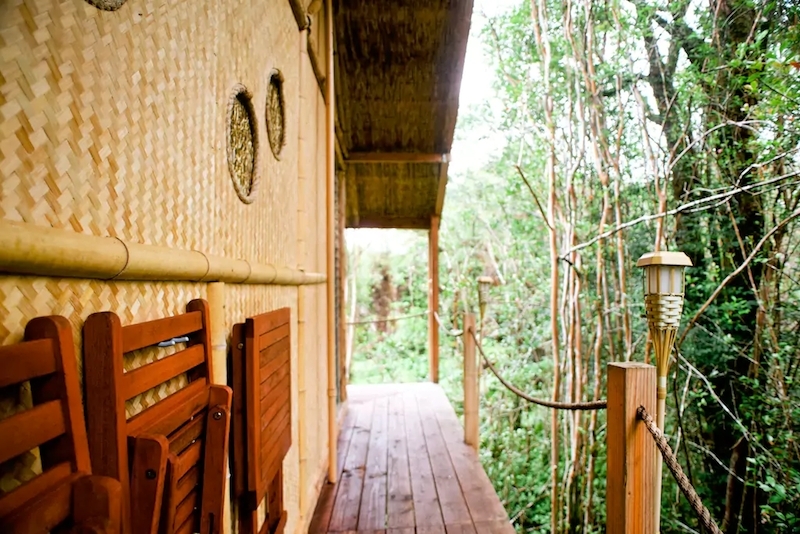 This one-of-a-kind treehouse , as described by a previous guest, is “glamping at its very, very best.” It brings you close to nature in a remote and secluded location, yet it is as luxurious as a treehouse can be. It’s exactly the kind of place that makes a memorable honeymoon — a cosy space and a comfortable bed basked in a peaceful atmosphere. 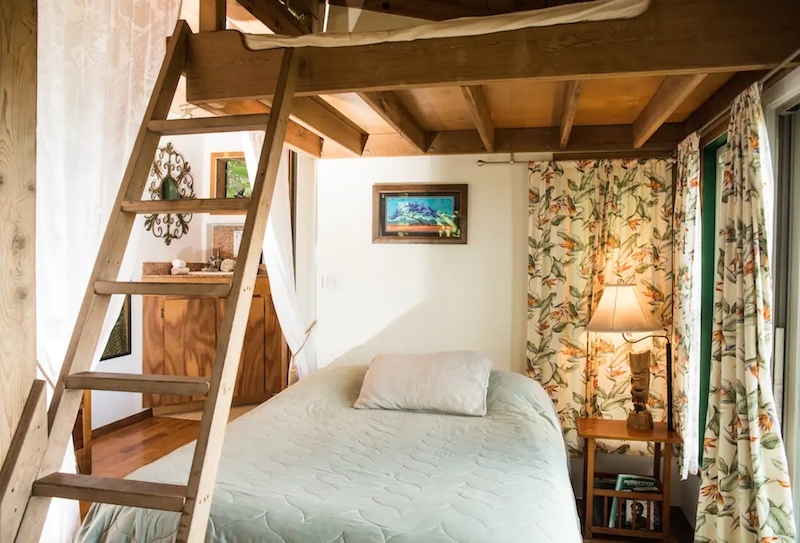 To make things even more special, the treehouse was actually hand-built by the Airbnb host herself. You can find a book where she pens down the construction process. Bring along food for your stay, and maybe even some ice for the cooler. While there’s no WiFi in the treehouse (quite understandably), you can find card games, a colouring book, interesting books, and even a pair of binoculars for birdwatching. 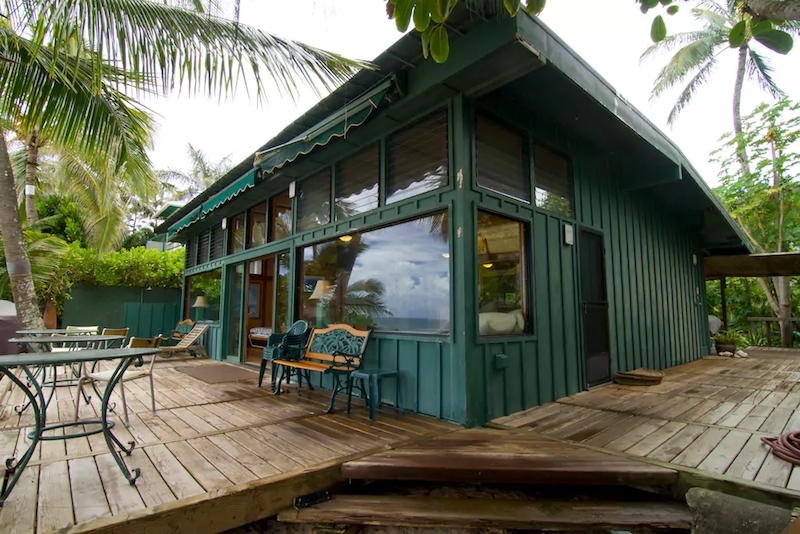 Wake up to views of the ocean when you stay in this solar home in Haleiwa, on the north shore of Oahu. 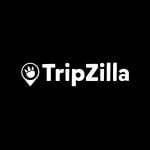 Not only that — it’s actually beside the Banzai Pipeline, often simply referred to as “Pipeline,” which is a legendary reef break that attracts surfers. You can have a show of surfers riding the pipeline if you visit during the season with big waves (in winter); on low seasons, you’ll feel as though you have a private beach at your doorstep. The main bedroom has a queen-sized bed and another hide-away bed that can be given more privacy with a roll-away room divider. There’s also another bedroom at the back with a queen-sized bed and three bunk beds. A local grocery store is within walking distance, and you can whip up meals in the kitchen. It’s equipped with a toaster, blender, microwave, oven, stove, and cooking utensils, so you’ll have everything you need for basic dishes. Otherwise, hit the food trucks a few blocks away for some takeaway meals. 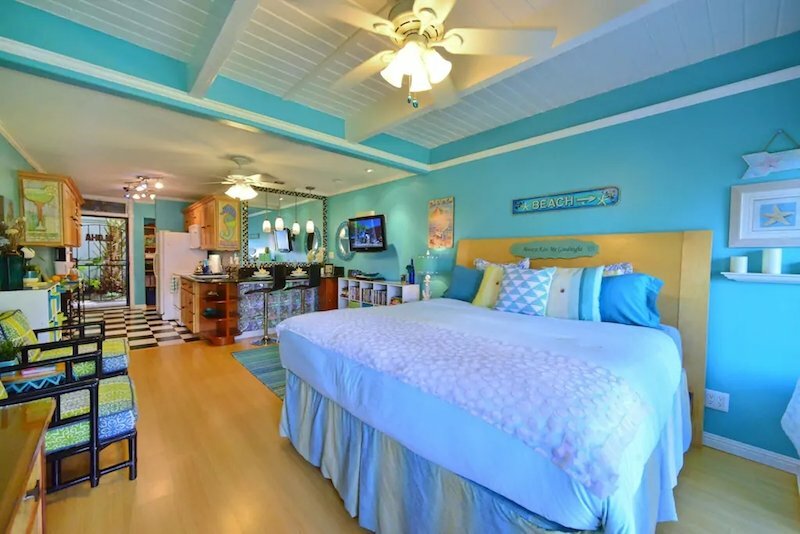 Listing name: #1 TRACY’S TROPICAL TREASURES:VOTED #1 IN MAUI! 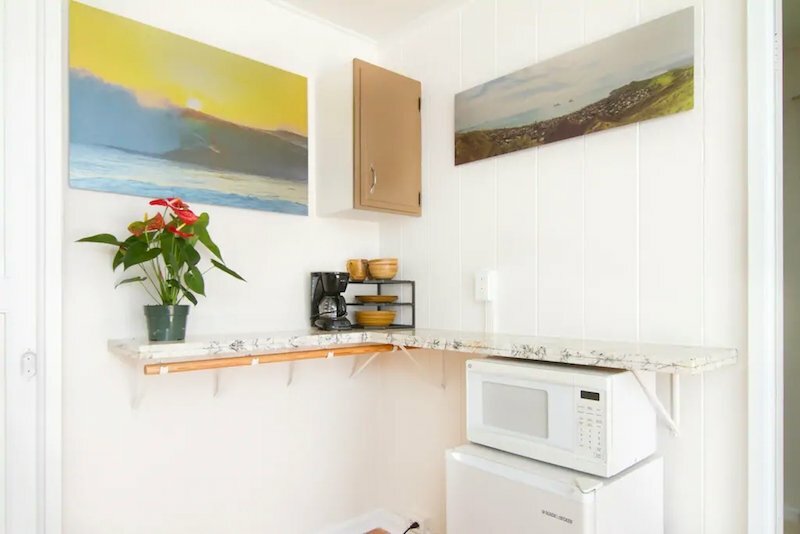 If you’re planning to visit Maui, the second largest of the Hawaiian islands, be sure to check out this apartment which proudly claims to have been awarded the #1 vacation rental in all of Maui. 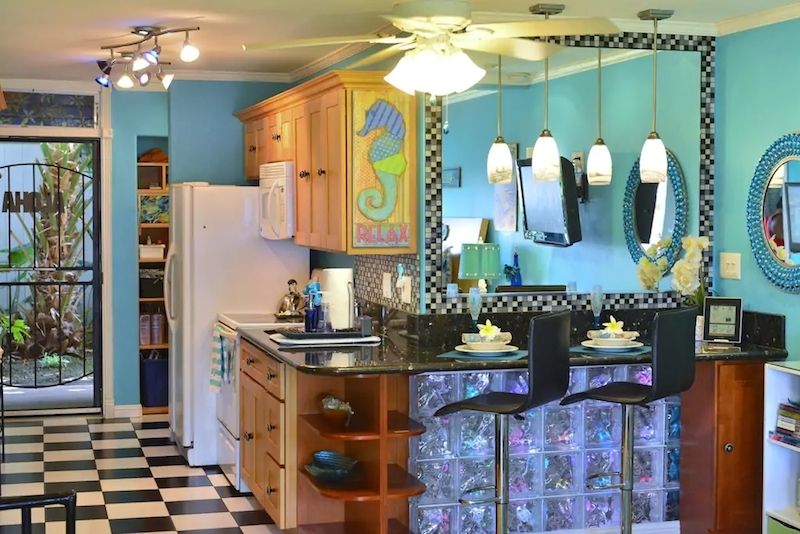 The space looks fantastic, with accents of blues to fit the tropical theme. The amenities inside rival that of an expensive resort. 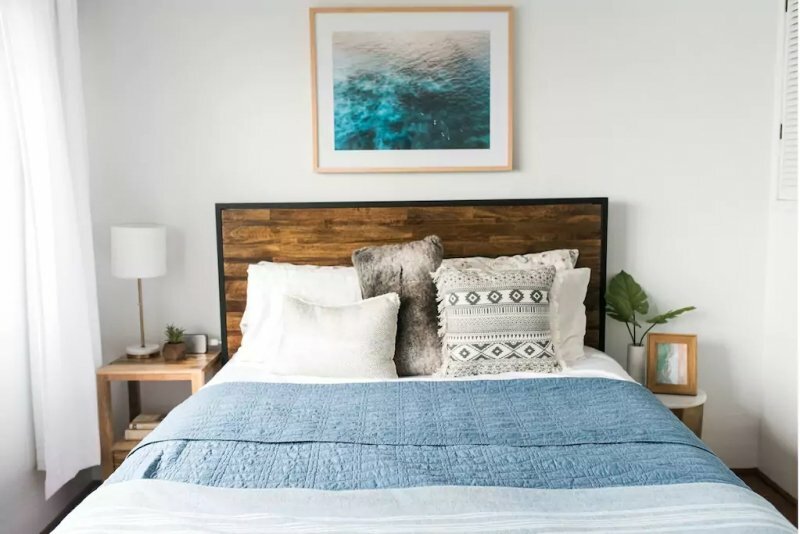 Just the bed itself exemplifies this: a plush king-size mattress is covered with a 100% bamboo bed sheet, 1,200 thread count duvet, and fluffy down-filled pillows. There are two flat-screen TVs on which you can stream videos or watch something from the selection of over 150 movies on DVD. There’s even a PlayStation to keep you entertained! Truly, the host has gone above and beyond to furnish the house in a manner that pampers guests to the fullest. Want to go off the grid? 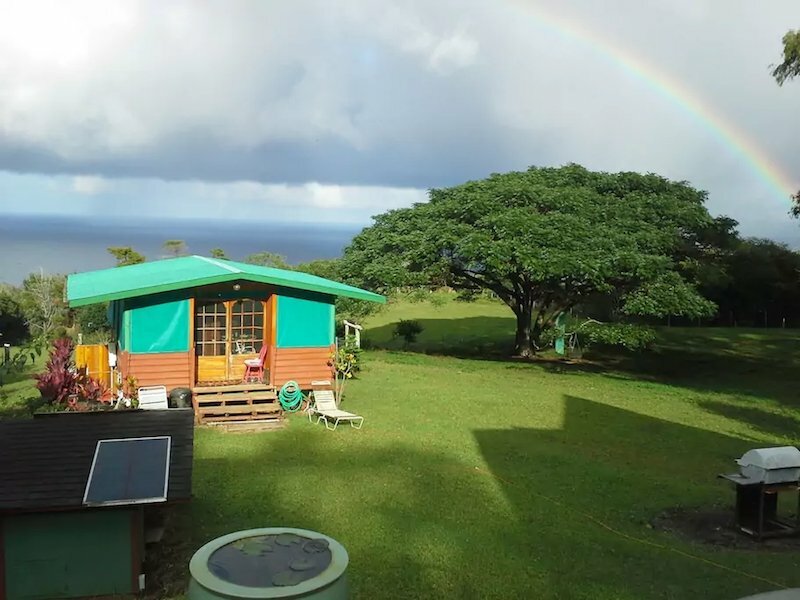 This cabin located between Waipio Valley and Volcano National Park offers just that and more. It’s best to rent a four-wheel drive to get here as access is along the back roads. 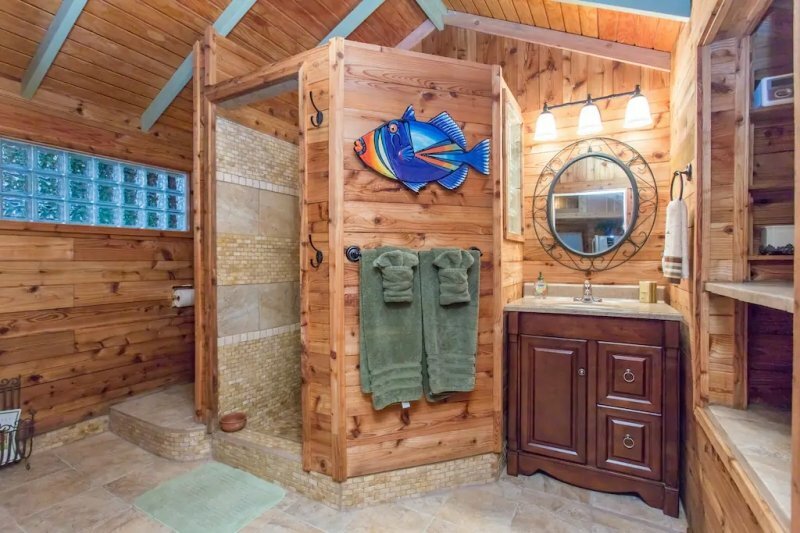 Minutes away from the property are hiking trails, private waterfalls, and swimming holes. Wildlife lovers will be delighted to know that there are horses and free-roaming peacocks and chickens in the backyard. You can crack a freshly-laid egg for breakfast, and if you don’t want to drive to a local cafe or restaurant for meals, be sure to bring your own food. The gas stove and fridge in the cabin will serve your cooking needs. And fret not about your comfort — hot showers are available, the bed is comfy, and hey, the outdoor toilet flushes, too! 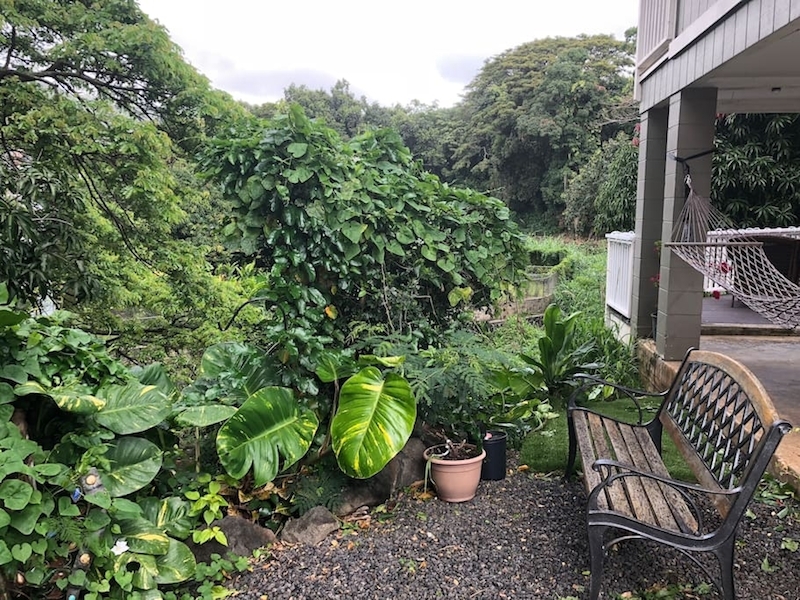 This hidden gem that is just ten minutes from the airport offers a central location ideal for exploring Honolulu or even the whole island of Oahu. Moreover, its tranquil backdrop ensures that you return home each night to a quiet location for a good rest. The highlight of this house is undeniably the stream, which is best enjoyed from the deck. 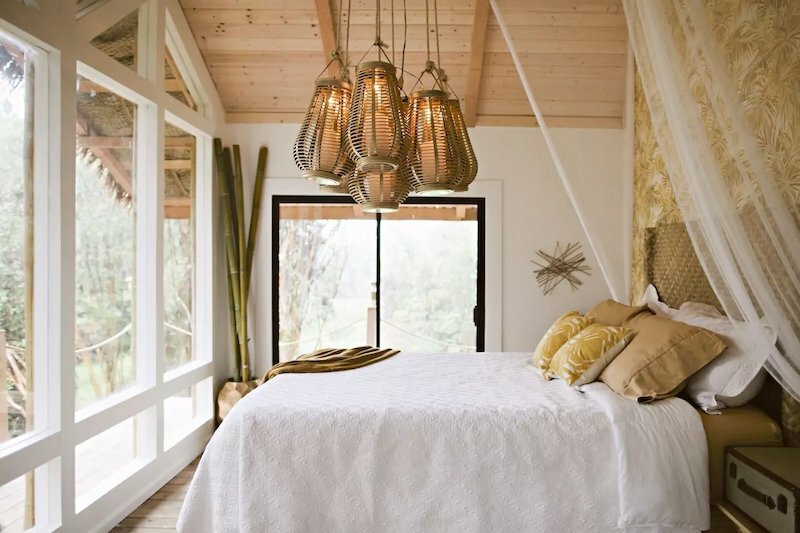 Guests will fall asleep to the sound of water, punctuated by the occasional chirping of birds and croaking of frogs. The host of the Airbnb lives upstairs, so you can easily reach him should you need anything, be it recommendations on places to visit or tips on the best restaurants. 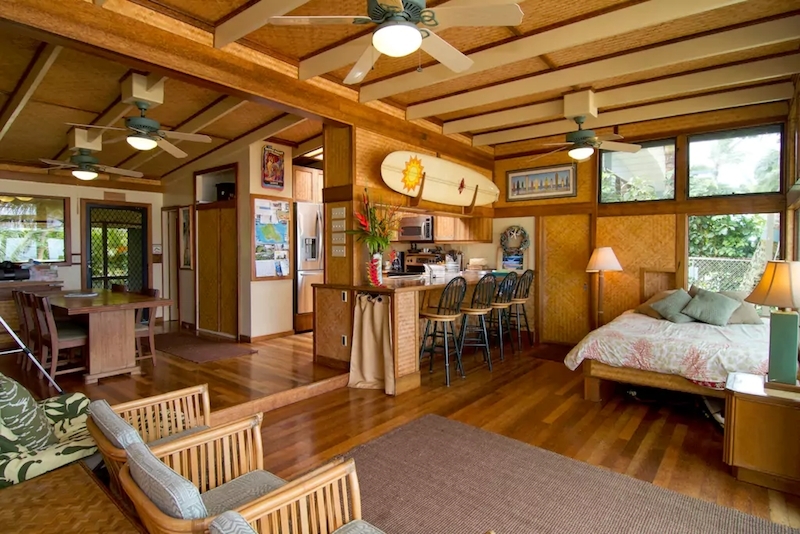 Many travellers come to Hawaii for the beaches, but take it up a notch by staying in a beachfront home . 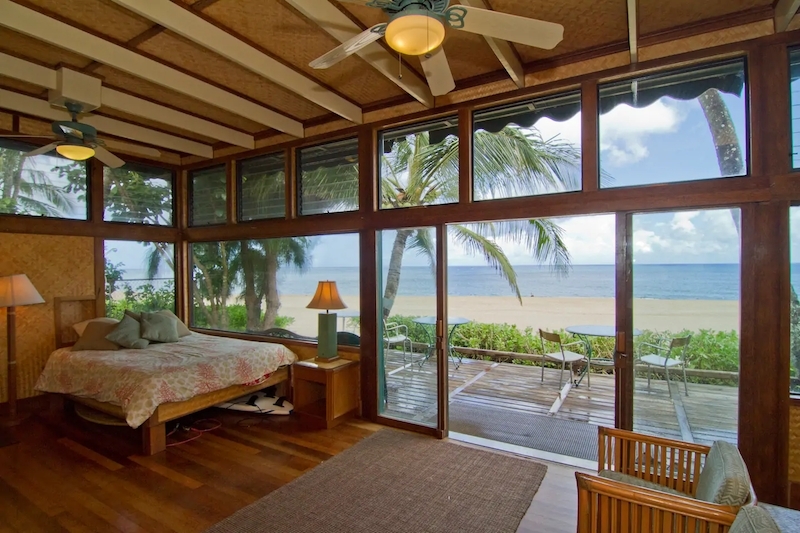 Located along Makaha Beach is this stunning house that is witness to breathtaking sunsets each evening. Capture the views while soaking in the pool overlooking the ocean. If you’re lucky, you might even catch sight of turtles, dolphins, and even whales during the right season. When the sun goes down, you can Netflix and chill the night away since there’s complimentary Netflix access. While there isn’t a kitchen in the studio home, you can utilise the grill outside for barbeques. Stock up on groceries at the farmer’s market, which is just a ten-minute drive away. 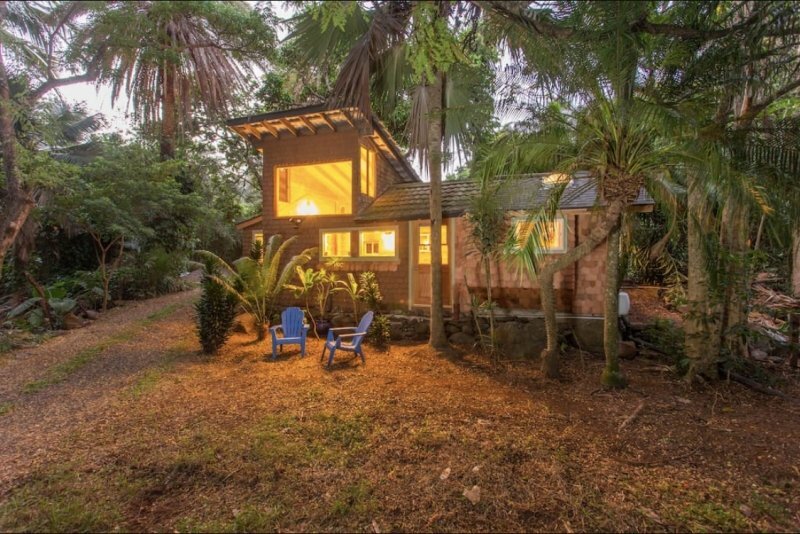 Listing name: Sunset Beach Treehouse Bungalow !!! 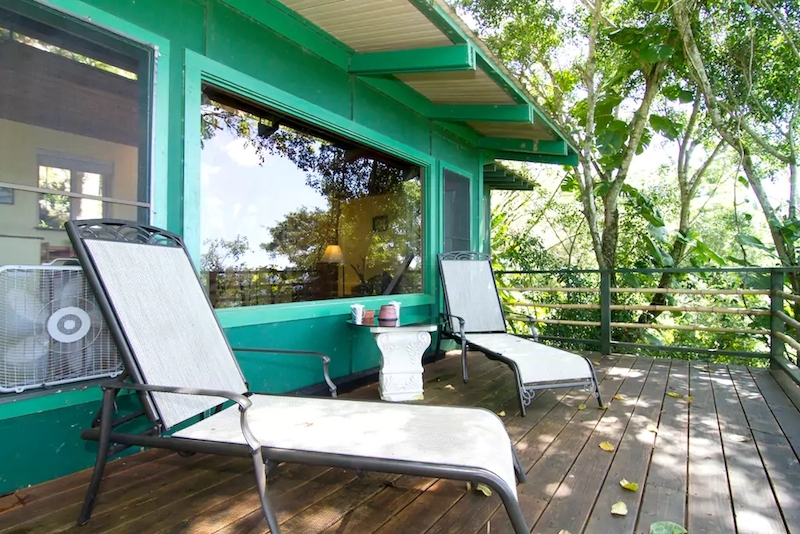 This bungalow with a green facade almost blends in with the jungle it’s surrounded by. 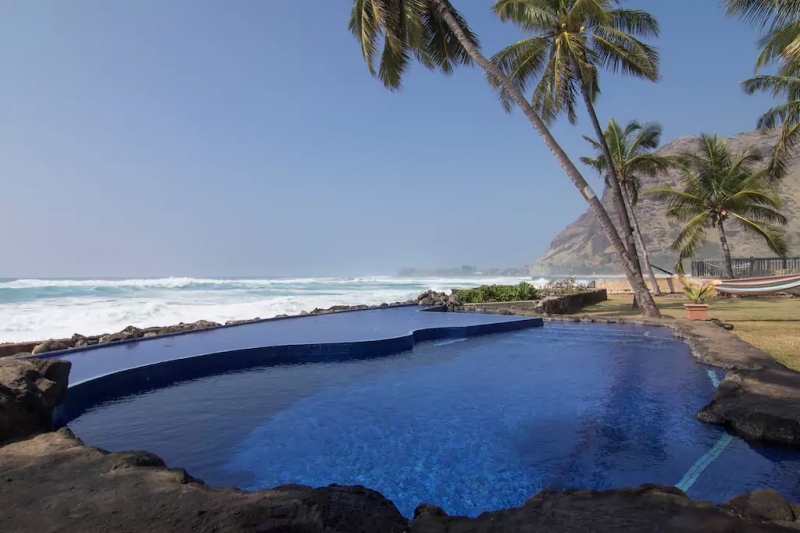 Located along the northern shores of the island of Oahu, this is a fantastic base for nature lovers, adventure seekers, surfers, and also yoga enthusiasts. Yoga classes are held in a communal yoga deck which overlooks the ocean. 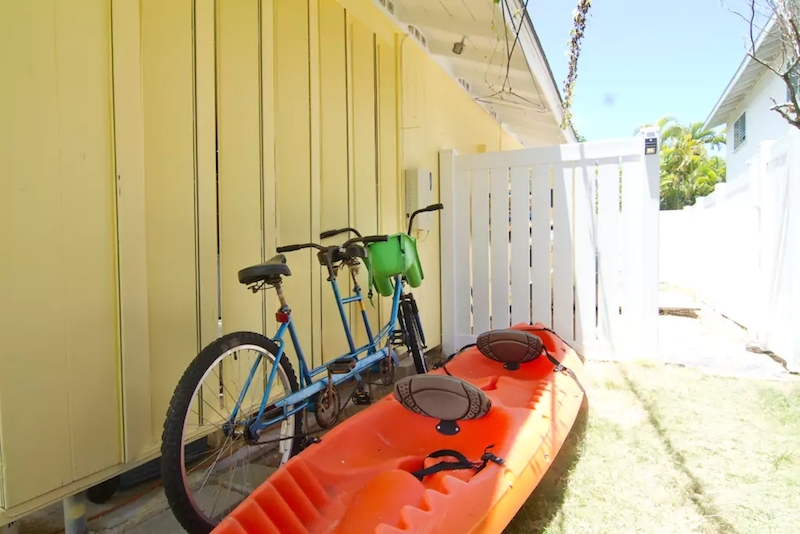 Kayaks, surfboards, paddle boards, bicycles and snorkel gear are available for use, so visitors who love the fun in the sun (and sea) will surely be kept busy during their whole stay. 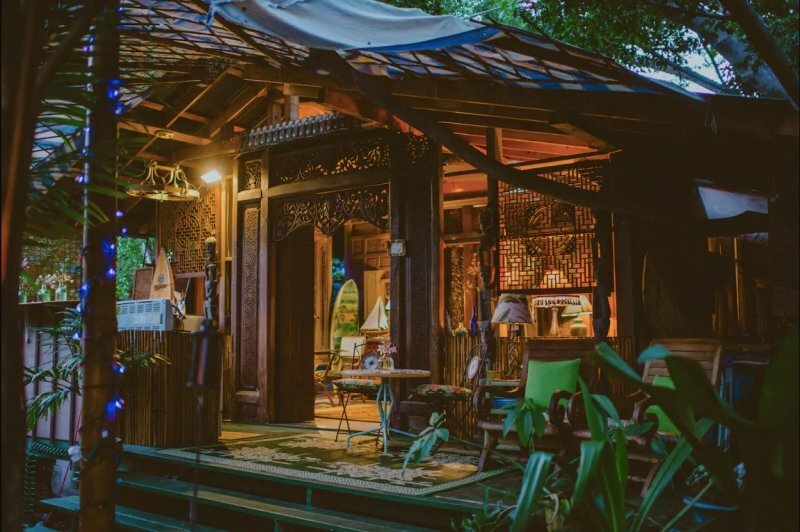 The bungalow itself is not luxurious, but it’s well-equipped, cosy, and comfortable. It's accessed via a flight of 80 steps — quite a workout but just imagine the views from the hilltop! 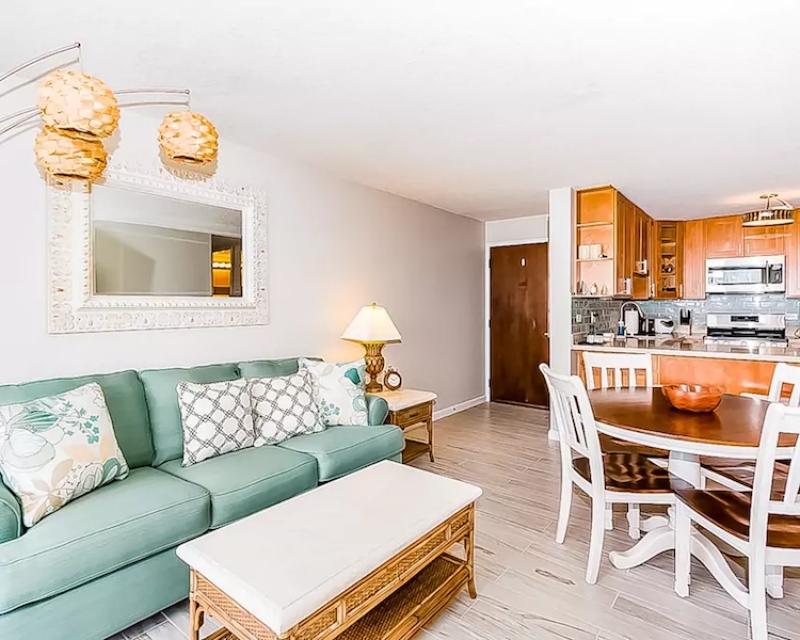 Another great base in Oahu, this studio near Kailua Beach beats an overpriced home rental in Honolulu. 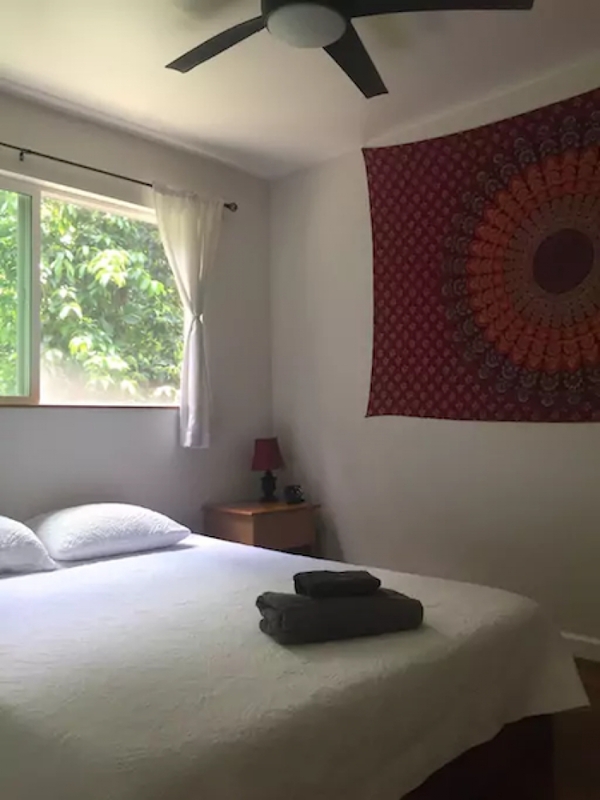 The room is compact and rather basic, with a bed, TV, microwave, and a mini-fridge, but there’s a lovely little backyard to relax in. On top of that, you can borrow tons of equipment or gear for beach activities, be it snorkels, fins, surfboards, or a kayak. It’s surely a great place for outdoor lovers. You can also hop on the tandem bike and ride into the heart of town where there are tons of shops and restaurants. Listing name: Everything you need to enjoy true paradise! 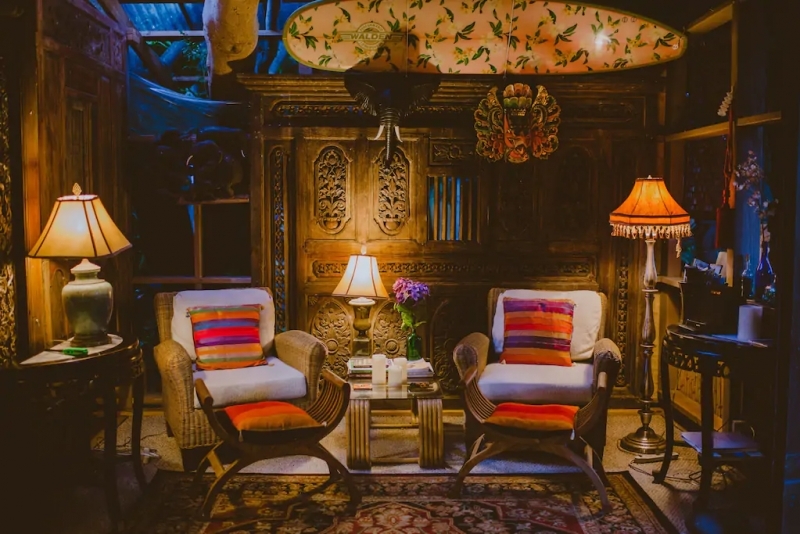 Here's an Airbnb that screams GORGEOUS! Every corner of this modern home is pleasing to the eyes. 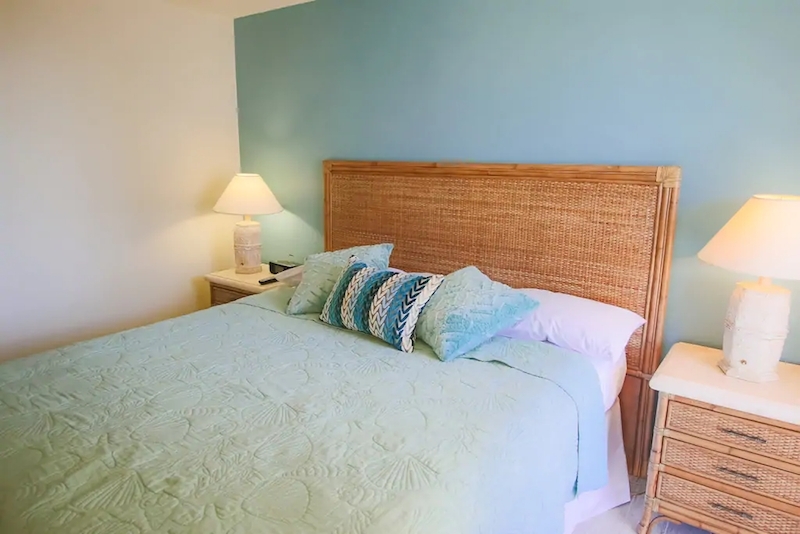 Close to downtown Kihei and Wailea, this condo is a short stroll to the beach and some excellent dining options. The hosts provide beach towels and chairs, which is a testament to their attention to detail. The queen-sized bed in the bedroom is brand new, and there's a fold-out couch in the living room for extra sleeping space. So maybe you’re bent on staying in Waikiki to discover all its fun and excitement. 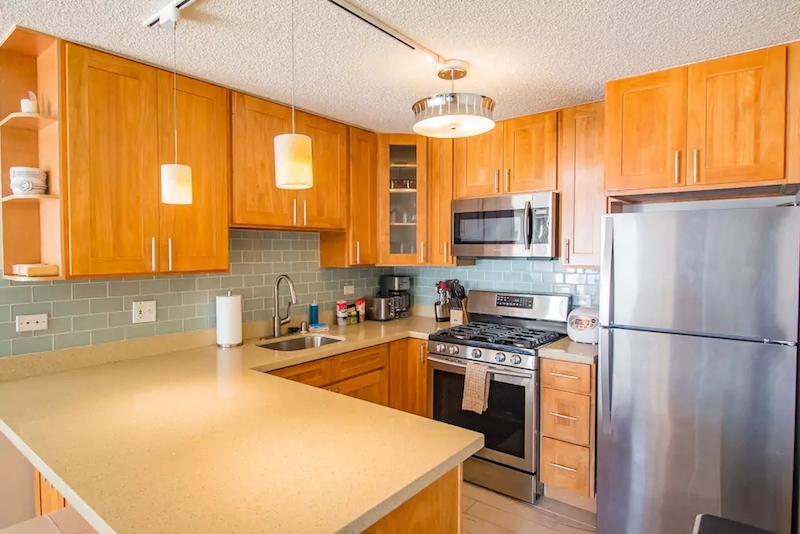 If that’s the case, then consider this studio loft on the 41st floor of the tallest tower in Waikiki. 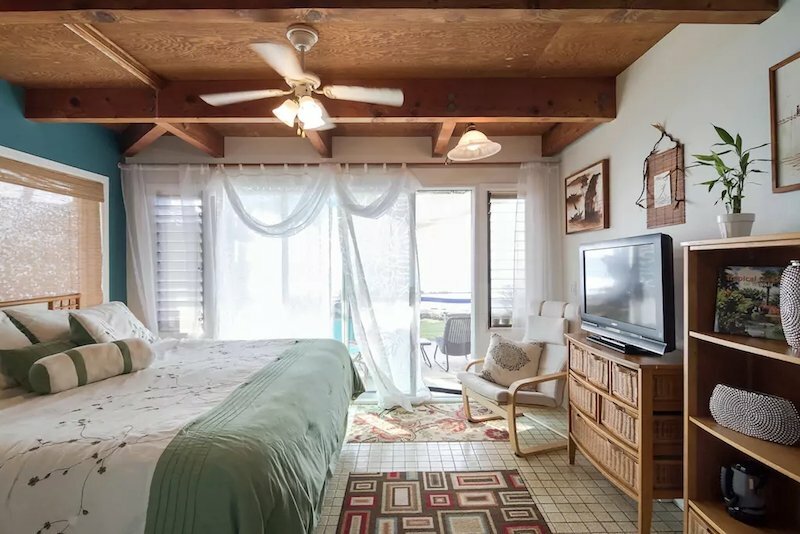 While there is a queen bed which sits right next to the mini-kitchen, it’s also possible to set up two single beds on the large lanai and sleep out in the open air. 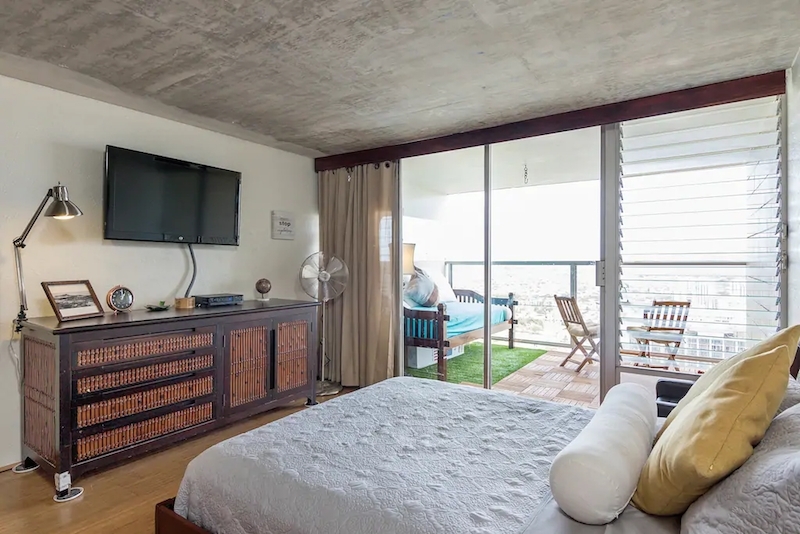 After all, the view, which encapsulates downtown Waikiki and Diamond Head, is the main draw of this studio loft. 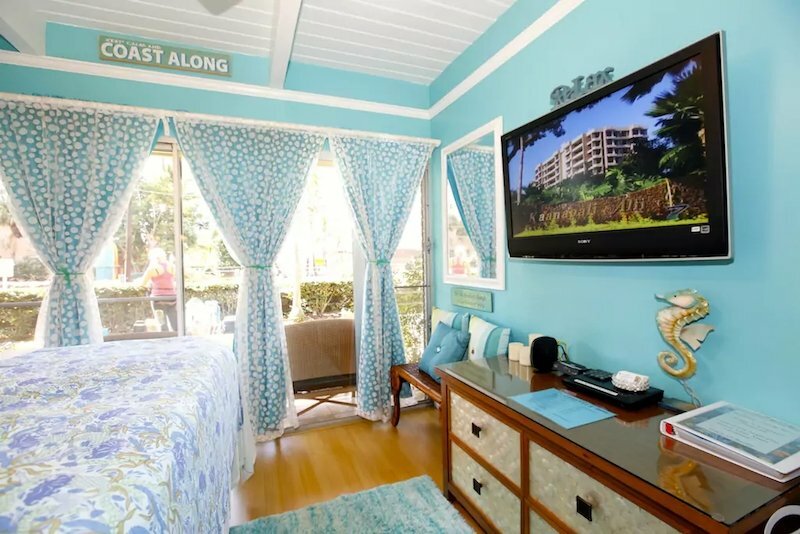 The location is also perfect, right in the centre of Waikiki and a five-minute walk to the Waikiki Beach. Families would be accommodated very nicely in this spacious two-bedroom condominium . 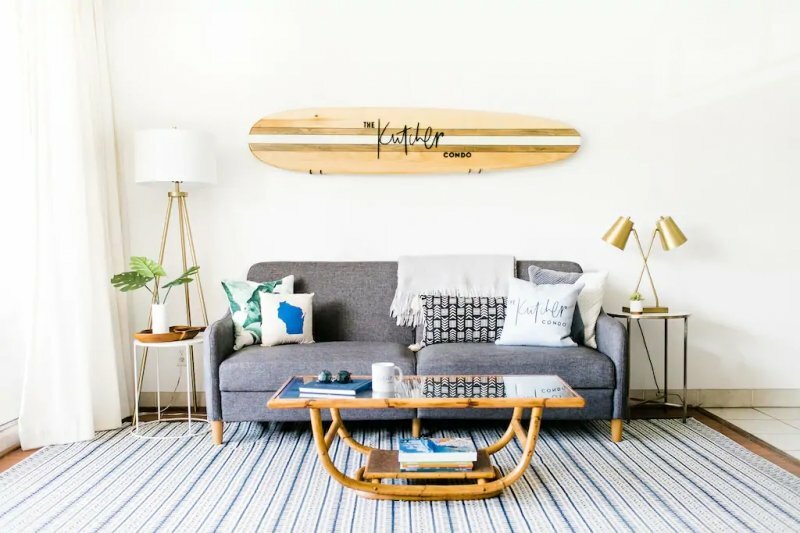 On top of providing a folding baby bed, a high chair, and kid-friendly eating utensils, there are also beach accessories, snorkelling equipment, beach umbrellas, mats, and floats. 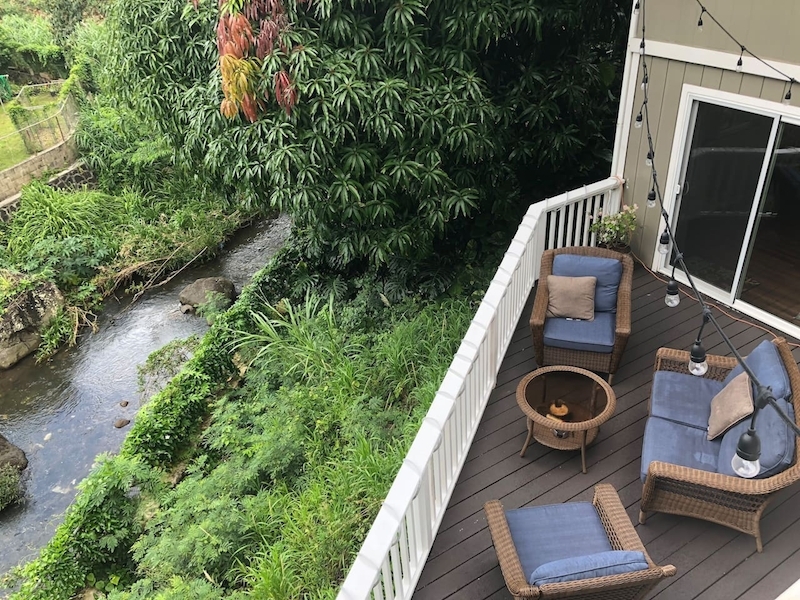 From the balcony, you can take in views of the Ala Wai Canal. 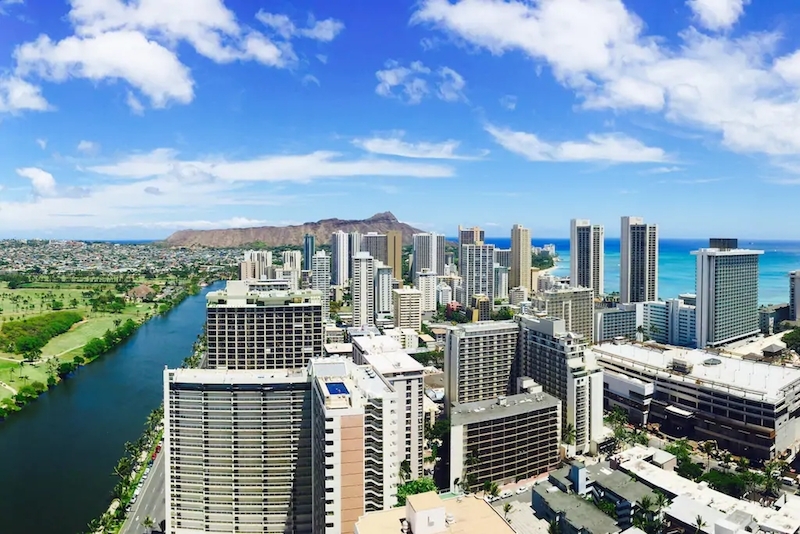 The Waikiki Strip is just five minutes away on foot and if you are driving, parking in the garage is also included. Do take advantage of the building facilities as well: a pool, spa, sauna, and also a rooftop deck! 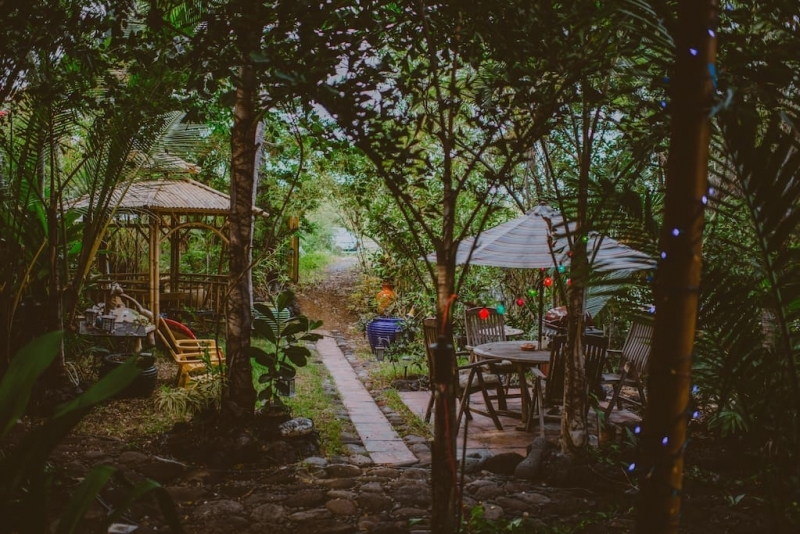 A gorgeous hideaway surrounded by greenery, this remodelled 1930's cottage is the ideal place for lovebirds who'd like to spend quiet time alone. 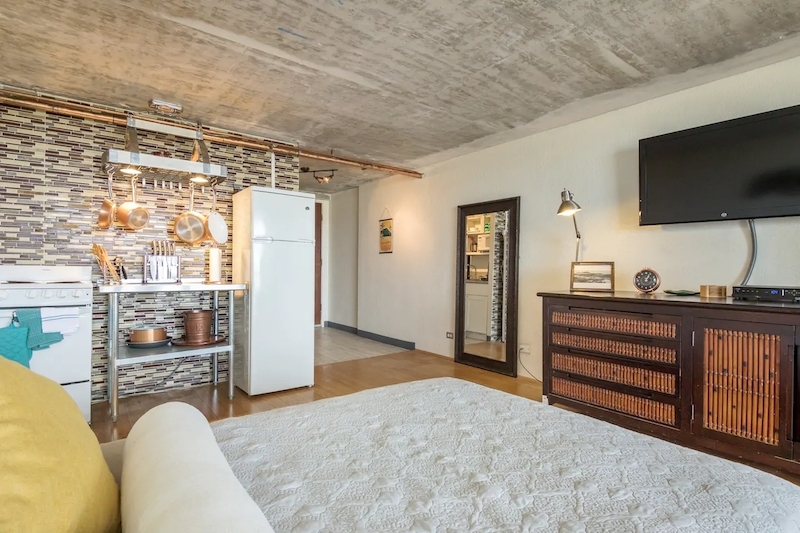 It's fully-equipped with a kitchenette and a spacious bathroom with custom tiles and woodwork. Though you'll be embraced with a rustic cabin feels, fret not, there's still wireless internet and a TV with Netflix access. It's best to have a rental car to get to the cottage; from there, it's 10 minutes to beaches and two minutes to shops and restaurants. 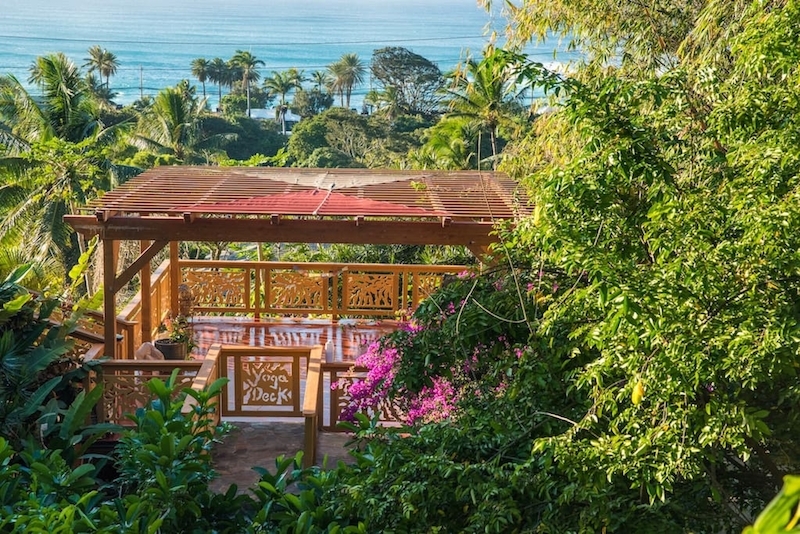 Tucked in Kealakekua Bay, close to Manini Beach, this gorgeous cottage emanates a tropical vibe with its Balinese-inspired design. It's built with teak panels and hides behind a large Ficus tree. 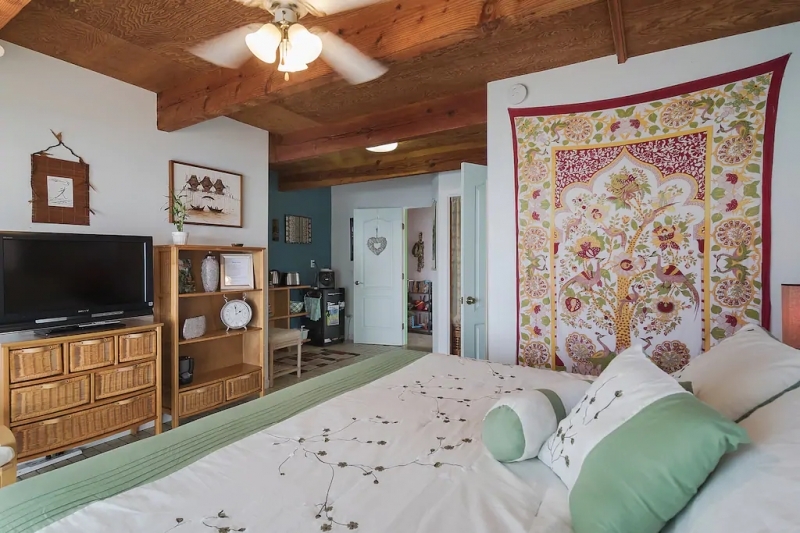 Keeping up with the location, there are surfboards mounted on the ceiling of the bedroom as decorations. 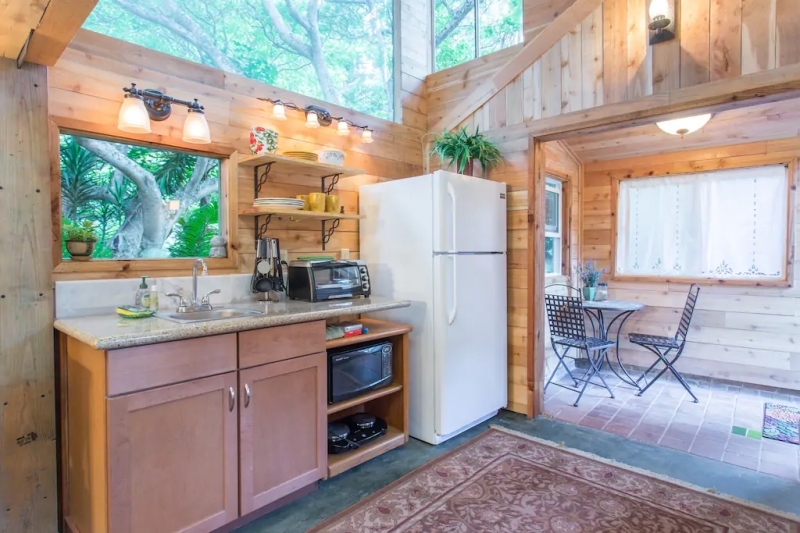 Rustic as it is, there's a fully-functional kitchen with a rice cooker, waffle iron, blender and more. The beautiful yard, which feels like a private little jungle, is a huge bonus! 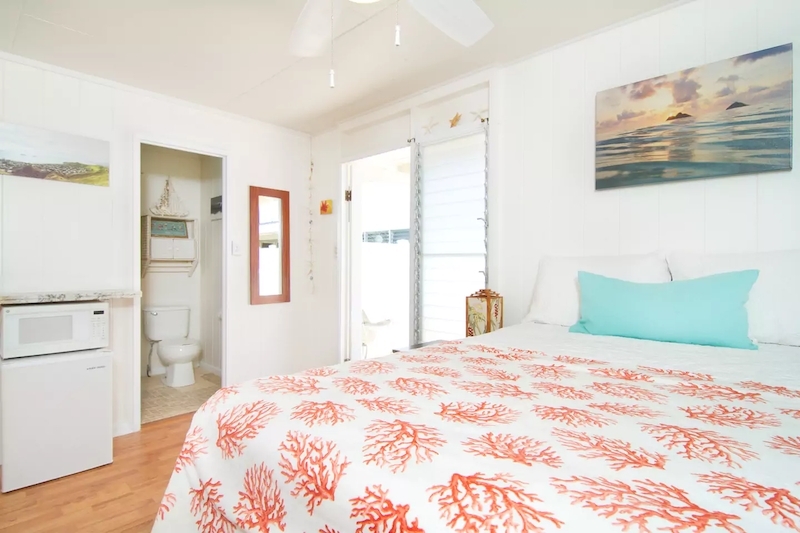 Have you found your dream Airbnb in Hawaii yet? Enjoy the experience, but don’t get too comfortable – you’ll need to overcome some inertia to set foot outside and explore the outdoors!